Conversation Cafe’s discovered, collated and shared objects, photographs and documents to tell the personal and community histories of those involved and affected by World War One. Run by Nicola Benge, Creative Director of Strike A Light, these informal sessions connected people with local places associated with WWI, enriched local heritage and provided opportunities to develop new interests. Material for activities were sourced in county and national archives, whilst local people and descendants of The Boys on the Plaque added new resources to our collection. October 21st – at Fabrica gallery then Friends Meeting House. We hosted a really lovely session today with our new Conversation Cafe group at Fabrica gallery and the Friends Meeting House in Brighton. Reminiscence activities, new WWI novels, an update from the Boys on the Plaque research group co-ordinator Ross Hammond, a talk about our WWI memorial plaque, plus tea and biscuits. What more could you want! We had a lovely time at November’s Conversation Cafe, meeting at Jubilee Library, Brighton with speaker Cuthbert Williams MBE, Chair of the organisation Brighton Black History. We shared stories of the BME community in the city during the Great War. Many thanks to him for taking time to come and meet our group and to Jubilee Library for hosting us for the session. We also had a brief look at our WWI themed book to accompany our sessions this winter: A God in Every Stone by Kamila Shamsie. This and future book loans have been kindly supplied by Brighton and Hove Library and Information Service. We hosted an enjoyable and informative event with Margaret Curson of the Rare Books Archiv, discussing other city based WWI memorials amongst other things. There was a great many resources on offer for us to explore and share, and Margaret was generous with her time and knowledge about the collection. There was a good turnout with much to share on the theme of family memories of WWI with a number of the group bringing in artefacts, letters, maps and more of near and distant relatives who’d served or fallen during the Great War as you can see from the images on Strike A Light’s website. We also discussed the book we’d be reading as part of the project, the WWI related book A God in Every Stone by Kamila Shamsie, which the group were on the whole, ambivalent about despite the good reviews from book sellers. Brighton featured in the book in a small way, but it also tackled big themes including colonialism, love, religion, war, class and more, which was a lot to process we felt! The Research group from the Boys in the Plaque Project, led by Ross Hammond, also joined the group to talk about the information and photos unearthed about the ‘Boys’ and what happened to them. This month, we were lucky to have an enjoyable session with guest speaker Dr Chris Kempshall, who is the Project Coordinator for the East Sussex in World War One project. 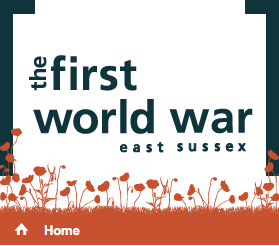 At the end of the centenary period, 2014 to 2018, everything that you see on the East sussex in World War One project website, all of the stories, images and details, will be archived at The Keep (East Sussex Record Office), to ensure future generations can explore the history of East Sussex in the First World War. We also be started a new Great War related novel ‘My Dear, I Wanted to Tell You’ by Louisa Young. We hosted a session viewing the amazingly drawn diorama of the first day of the battle of the Somme (1st July 1916) by cartoonist Joe Sacco. The main theme though of our session this month was with the very well-informed Stoolball England officer Anita Broad, discussing all things related to this Sussex based sport and its’ link to World War I and rehabilitation. Our Conversation Cafes group have raced ahead with our related reading activity, looking at novels and non fiction books related to the Great War. Everyone who attended this week has already finished the book My Dear I Wanted to Tell You by writer Louisa Young. We chatted about it and it was a popular read. In April we were spoilt with two wonderful guest speakers. Dr Sam Carroll of the Gateways to WWI project talked about the breadth of this project, and discussed aspects of their activities and experiences alongside discussions about the Great War. We were also joined by Douglas d’Enno, a historian, linguist and journalist who has made an exhaustive study of the impact of the First World War on Brighton. Douglas is the author of new book, Brighton in the Great War, which features The Boys on the Plaque project! We also got our next joint book read – Belongings by Umi Sinha. Jo Palache from Brighton Museum was our speaker at May’s Conversation Cafe. She talked about piecing together the stories of the Pavilion Military Hospital from it’s beginnings treating Indian Soldiers to its work with British amputees. She will gave an overview of the hospital’s history from the Indian to the Limbless hospital for those who aren’t familiar with it, and will then focus on some stories of the individuals involved, in reference to the new Pavilion Blues exhibition at Brighton Museum. The group also discussed a novel by local author Umi Sinha called Belonging. June 8th – Meet at the front of Jubilee Library to then go on to Pavilion Blues: Disability and Identity – an exhibition at Brighton Museum. A group visit to this new exhibition, plus, receive the new group book read for June; Suicide Club by Andrew Williams. This session will host visitors from the WWI themed Brighton’s Graphic War book project from QueenSpark Books. A final session and discussion of our themes and events, joined by the Boys on the Plaque Volunteer Research group.